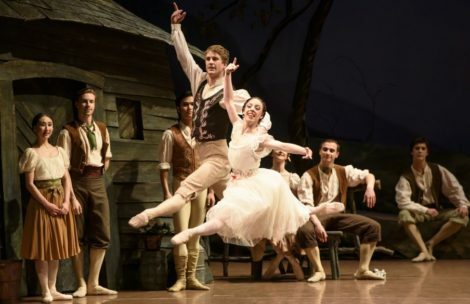 There are a number of things to admire in Royal New Zealand Ballet’s current production of Giselle, choreographed and produced for the company by Ethan Stiefel and Johan Kobborg in 2012. As one enters the theatre a front curtain is down and it immediately promises something interesting. We see a finely drawn tree with a brown trunk and spreading brown branches with small, red, heart-shaped leaves attached. The colours set the season (the ballet traditionally takes place at harvest time), as well as giving a clue to the emotional story we will encounter. As the curtain rises, small white shapes, a little like tear drops, appear on the cloth, and dark twisted roots emerge and move mysteriously (lighting by Kendall Smith). It is a wonderful piece of scenic art by American designer Howard C Jones. It has a beautiful simplicity and yet prefigures so many of the ballet’s themes. As Act I unfolded, I admired the way in which Stiefel and Kobborg had developed the male characters. The peasant men seemed a rough and tumble lot and at one stage engaged in a bout of light-hearted pushing and shoving. They were not the overly genteel peasants we so often see standing in perfect ballet poses. In fact we often saw them slouching around in the background. The character of Hilarion was also nicely developed. 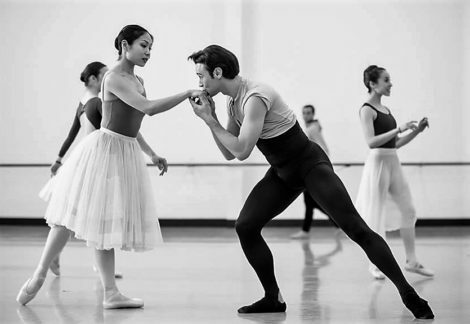 He was given a solo in the first act, which drew more attention to his participation in the life of the village and his place in the story as Giselle’s long-term admirer. The role was strongly danced by Jacob Chown in one cast and Paul Mathews in another. Mathews in particular showed some exceptional elevation and seemed to relish every vigorous moment of the Act I solo. On the other hand, Chown was the one who put up a thrilling fight against the Wilis in Act II and in his dancing seemed to be buffeted back and forth by some supernatural power. Wilfred, aide to Albrecht (disguised as Lenz—not Loys! ), was also encouraged to be a stronger character than usual. It was not that he was given anything extra to do, so bouquets to the dancers and to the coaching staff. I saw Jacob Chown and William Fitzgerald and enjoyed both interpretations, although Chown seemed to add a mature factor to his characterisation, which I thought particularly suitable. I also was surprised, but pleased, to find, with the arrival of the titled landowners (usually on a hunting excursion, but in this production out riding), that the Duke and and his daughter Bathilde did not enter Giselle’s cottage to rest, as usually happens—I have often pondered why they would take a rest in such a rudimentary structure. Instead, in this production, they headed off to continue their ride. This of course meant that other arrangements had to be made to call them back to the village for the unmasking of Albrecht, of which more later. I also enjoyed the inclusion of children and older people as extras in the village scenes of Act I. It made for a more natural look than what we are used to. 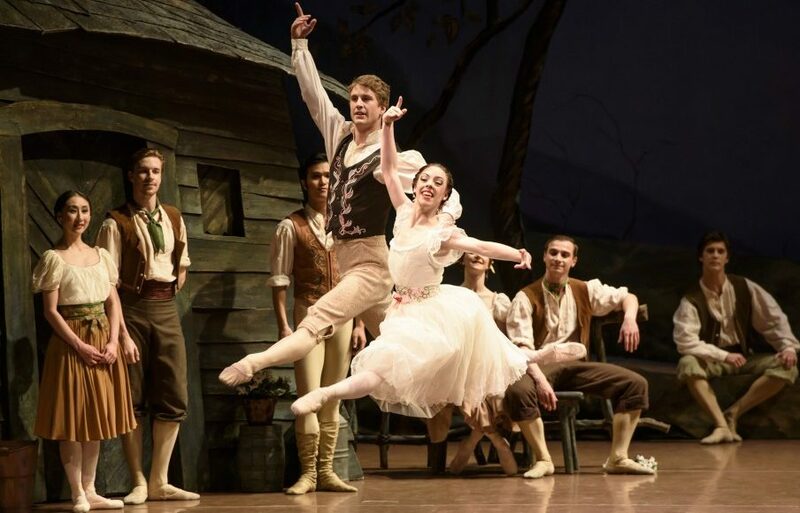 Choreographically Stiefel and Kobborg have kept some of the well-known sections, especially in Act II where the steps performed by Giselle and Albrecht (pas de deux and solos); some sections by Myrtha, Queen of the Wilis; and some of the corps de ballet work were familiar. But large sections of Act I, especially the dances for the corps de ballet, had been reworked and were more like character dances than the classically-based choreography we usually see. Some of the group dances for the Wilis in Act II had also been reworked and there seemed to be focus on circular patterns and movements. I saw two casts in the leading roles of Giselle and Albrecht—Mayu Tanigaito partnered by Daniel Gaudiello and Lucy Green partnered by Qi Huan and all danced more than adequately. Gaudiello made something spectacular of Albrecht’s solo dances in Act II. His cabrioles were breathtaking in their precision and he soared into his jumps. A triple attitude turn was a thrill to see, and his set of entrechats was stunning. But he also brought many charming extras to his portrayal—a little brush of his hand along Tanigaito’s arm before taking her hand, a benign glance here and there. Such things have long been a feature of Gaudiello’s acting and it was a treat to see him once again. But in this production of Giselle, there were also a number of things not to like. Much impact was lost in Act I when Berthe, who needs to recount the story of the Wilis and the effect they have on jilted young girls, had been allocated a much reduced story to tell. Neither of the dancers I saw as Berthe—Alayna Ng and Madeleine Graham—was able to impart a sense of impending doom. And not only that, Giselle’s friends took absolutely no notice of Berthe’s story. They were busy upstage admiring a friend’s wedding outfit. And sadly, nothing in a mime or choreographic sense was made of the musical leitmotif for the Wilis, which we hear during Berthe’s mime scene. It is the musical link between the first and second acts and recurs during the mad scene and then at the beginning of Act II. Berthe needs to be clearly aware of this leitmotif in her mime, or with some kind of reaction, so she can begin a dramaturgical link. Then there was the issue of the horn, usually hung outside the cottage by a member of the hunting party when the Duke and Bathilde retire to the cottage. Hilarion uses it to call the hunting party back after he has discovered Albrecht’s true identity. 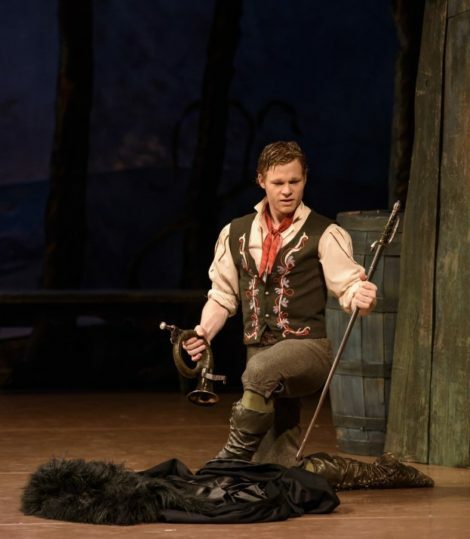 But since there was a change to the storyline in the Stiefel/Kobborg production, Albrecht arrives in the village with a sword at his side and the horn around his neck. Now why would he be carrying a horn? It didn’t make sense to me and looked like a clumsy addition and simply (as indeed it was) a way of sneaking the horn in so that Hilarion had something to use when he needs to summon the hunting/riding party. I also wondered why there was a need to remove the grape harvest part of the original narrative, thus weakening the story. The grape harvest is a rationale for the Duke and his party to stop to quench their thirst at Giselle’s village. They drink the wine of the area, which is served with pride by Giselle and/or Berthe. Removing this aspect of the story also denies Giselle a place as the Harvest Queen and makes her, in many ways, a lesser person in the village. Replacing the Harvest Queen with a Wedding Couple, who also dance the peasant pas de deux, is interesting but to my mind is playing with the story for no apparent purpose. I was also unimpressed by some of the costumes (designed by Natalia Stewart) especially that for Albrecht in Act II. His jacket had such a high collar that his neck all but disappeared and occasionally reduced the classical look of the choreography. And there were times when Albrecht seemed to have a hunchback due, I can only surmise, to the cut of the jacket. This happened more in the case of Gaudiello as the costume seemed to be a better fit on Qi. I wish too that Myrtha had been given the wreath of flowers she usually wears as a headdress. It would have given Clytie Campbell, whom I saw as Myrtha at both performances, added presence and would have distinguished her somewhat from the band of Wilis she leads. It may not have seemed so annoying had the role of Myrtha been given the same attention as the minor principal roles of Hilarion and Wilfred. As it was parts of the second act seemed a little underwhelming. Stiefel and Kobborg have added a rather nice framework within which the story unfolds. When the ballet opens we see, through a scrim and seemingly within the swirling roots of the tree of the front curtain, the figure of a man, the Older Albrecht. He appears briefly at the beginning and end of both acts as an observer and relives, as a program note tells us, ‘the story that has possessed his being for nearly a decade.’ But for me this Giselle does not stand up to those productions that have brought tears to my eyes and sent me home from the theatre on a high. News of Daniel Gaudiello is great Michelle – your description brings back many memories of his very unique style and contribution to the AB. Glad to hear that he is still in peak form. Good to hear from you Adrian. Yes, Daniel Gaudiello is a very special artist. Not only do we see a wonderful technique but he adds that ‘something extra’. So rare really. We were very lucky to have watched him over several years with the Australian Ballet. I have just added another rehearsal image to the post. I have not yet mastered adding images to comments!